MANY predictions were made on New Year's Day that this is the year in which the Axis will be annihilated and the war will end. Strongest statement came from Admiral Halsey who prophesied that 1943 will see "complete, absolute defeat for the Axis powers," including Japan. The Ad­miral has done a great job of knocking the Japs out of the water, and his year-end statement sets up a target for all of us to shoot at this year. But it should be interpreted as a goal, not as an accomplished fact, as has already been done in some places. For instance, in North Africa some men have bet a month's pay the war will end before June 1. In England, 50 bucks were wagered that we'll be out of the fox holes by July 1. Books have been opened in several U. S. cities setting various Armistice dates this year. It's a cinch those short-term bets will be lost. Look at this from Churchill: "Do not let us be led away by any fair-seeming appearance of fortune. I know of no­thing ... which justifies the hope that the war will not be long or that bitter and bloody years do not lie ahead." Notice that "years" is plural, bub. President Roosevelt said: "This is the toughest war of all time." And Joseph C. Grew, our ambassador to Tokyo for 10 years, says: "The Japanese will not crack.... Only by utter physical destruction or utter exhaustion of their men and materials can they be defeated." Ask the guys on Guadalcanal and New Guinea if that sounds like a one-year job to them. The trouble with getting too bullish is that over­confidence causes you to get knocked off. That's what happened last Fall when Holy Cross whipped undefeated Boston College's football team 55-12. That's what happened the year Bill Terry asked if Brooklyn was still in the league. 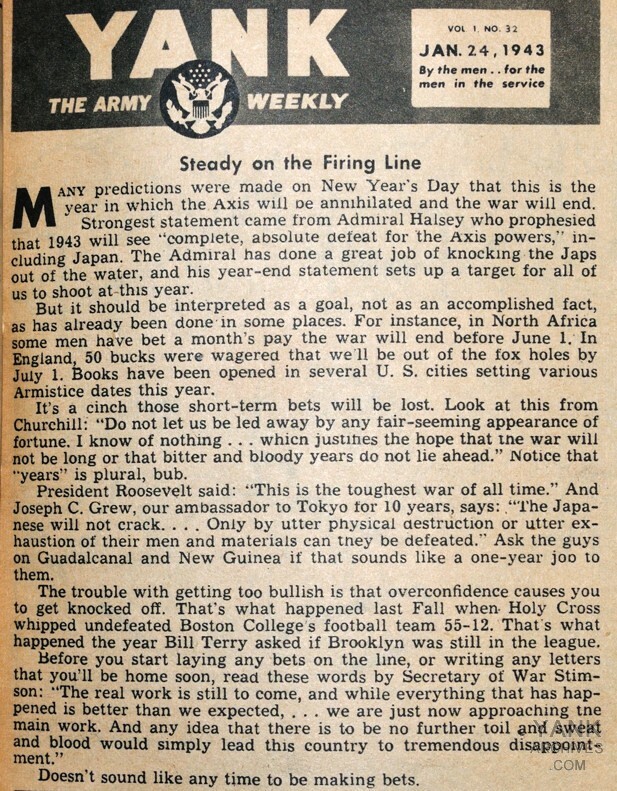 Before you start laying any bets on the line, or writing any letters that you'll be home soon, read these words by Secretary of War Stimson: "The real work is still to come, and while everything that has happened is better than we expected, ... we are just now approaching the main work. And any idea that there is to be no further toil and sweat and blood would simply lead this country to tremendous dis­appoint­ment." Doesn't sound like any time to be making bets.